Vietnam era US soldiers not quite with the program. In fact, statistics flowing back to Washington about the American war machine in Vietnam then pointed toward an unimaginable nightmare. Drug use was rampant; desertions stood at 70 per thousand, a modern high; small-scale mutinies or “combat refusals” were at critical, if untabulated, levels; incidents of racial conflict had soared; and strife between “lifers” and draftees was at unprecedented levels. Reported “fraggings” — assassination attempts — against unpopular officers or NCOs had risen from 126 in 1969 to 333 in 1971, despite declining troop strength in Vietnam. According to Colonel Heinl’s figures, as many as 144 antiwar underground newspapers were being published by, or for, soldiers. And most threatening of all, active duty soldiers in relatively small numbers (as well as a swelling number of Vietnam veterans) were beginning to actively organize against the war. When, in January 1973, before the war was even over, President Richard Nixon announced that an American draft army was at an end and an all-volunteer force would be created, this was why. The U.S. military was in the wilderness without a compass, having discovered one crucial thing: you couldn’t fight an endless, unpopular counterinsurgency war with the kind of conscript army a democracy had to offer. What resulted, of course, was the AVF, a moniker that, as Andrew Bacevich has written in his book The New American Militarism, was but “a euphemism for what is, in fact, a professional army… [that] does not even remotely ‘look like’ democratic America.” Citizenship and the obligation to serve were now officially severed and, from the 1980s on, most Americans would ever more vigorously cheer on the AVF from the sidelines, while it would be a force theoretically purged of possible Vietnam-style dissent and refusal. Over the years, in response to such feelings, some American soldiers have come up with ingenious ways to express defiance or dissent on our distant battlegrounds. These have been little noted in the mainstream media, and when they do surface, officials in the Pentagon or in Washington just brush them aside as “bad apple” incidents (the same explanation they tend to use when a war crime is exposed). 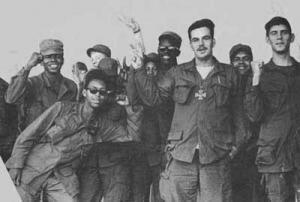 Aliff referred to this tactic as engaging in “search and avoid” missions, a sardonic expression recycled from the Vietnam War when soldiers were sent out on official “search and destroy” missions. Sergeant Geoff Millard of the New York Army National Guard served at a Rear Operations Center with the 42nd Infantry Division from October 2004 through October 2005. Part of his duty entailed reporting “significant actions,” or SIGACTS — that is, attacks on U.S. forces. In an interview in 2007 he told me, “When I was there at least five companies never reported SIGACTS. I think ‘search and avoids’ have been going on for a long time. One of my buddies in Baghdad emails that nearly each day they pull into a parking lot, drink soda, and shoot at the cans.” Millard told me of soldiers he still knows in Iraq who were still performing “search and avoid” missions in December 2008. Several other friends deploying or redeploying to Iraq soon assured him that they, too, planned to operate in search and avoid mode. In response, the military broke up the platoon. Each individual involved was also “flagged” so he would not get a promotion or receive any award due. After finishing his tour in Iraq, Simpson joined the Reserves because he believed it would grant him a two-year deferment from being called up, but he was called up anyway. In his own case, he says, “I thought to myself, I can’t do this anymore. First of all, it’s bad for me mentally because I’m doing something I loathe. Second, I’m participating in an organization that I wish to resist in every way I can. On May 27th, rejecting an Article 15 — a nonjudicial punishment imposed by a commanding officer who believes a member of his command has committed an offense under the Uniform Code of Military Justice — Agosto demanded to be court-martialed. The Iraq War boils on at still dangerous levels of violence, while the war in Afghanistan (and across the border in Pakistan) only grows, as does the U.S. commitment to both. It’s already clear that even an all-volunteer military isn’t immune to dissent. If violence in either or both occupations escalates, if the Pentagon struggles to add more boots on the ground, if the stresses and strains on the military, involving endless redeployments to combat zones, increase rather than lessen, then the acts of Agosto, Bishop, and Shepherd may turn out to be pathbreaking ones in a world of dissent yet to be experienced and explored. Add in dissatisfaction and discontent at home if, in the coming years, American treasure continues to be poured into an Afghan quagmire, and real support for a G.I. resistance movement may surface. If so, then the early pioneers in methods of dissent within the military will have laid the groundwork for a movement. “If we want soldiers to choose the right but difficult path, they must know beyond any shadow of a doubt that they will be supported by Americans.” So said First Lieutenant Ehren Watada of the U.S. Army, the highest ranking enlisted soldier to refuse orders to deploy to Iraq. (He finally had the military charges against him dropped by the Justice Department.) The future of any such movement in the military is now unknowable, but keep your eyes open. History, even military history, holds its own surprises. Dahr Jamail, a TomDispatch regular, has reported from Iraq and writes for Inter Press Service, Le Monde Diplomatique, and other outlets. He is the author of Beyond the Green Zone: Dispatches from an Unembedded Journalist in Occupied Iraq and the forthcoming book The Will To Resist: Soldiers Who Refuse to Fight in Iraq and Afghanistan. His website is Dahrjamailiraq.com. Research support for this article was provided by the Investigative Fund at the Nation Institute. Hey all you young hipsters – this is very very important history of your people. know it, learn it, teach it.